The Chanel little black dress owned by Romy Schneider. The Louveciennes from the last Dior’s collection. The flamboyant Yves Saint Laurent cocktail dress embellished with precious stones. Enough to give a heart attack to every fashion fan and it’s only a mere glimpse of an unique auction of the finest fashion items at Paris Sotheby’s, on 8 July. There are two reasons why the great interest about the sale is expected. To start with, for the first time Sotheby’s organises its fashion sale in place so significant for haute couture as Paris. Secondly, pieces put up for auction come from private collection of Didier Ludot, known as one of the world’s most famous couture dealers. His store at Galerie Montpensier is almost a mythical place due to the collection of vintage pieces from French designers, such as Chanel or Givenchy. This fashion antiquarian specially for Paris Sotheby’s selected 150 remarkable items that form an overview of 20th century fashion, as well as a tribute to the whole French haute couture micro cosmos. The range of marvellous gowns, garments and accessories spreads from those produced in 1920s to items created in early 2000. Many different epochs, many different styles and variety of women, some of them legendary, some of them anonymous. Every dress tells a story, according to auction arrangers. Among other things revealed by Paris Sotheby’s, particularly spectacular is cocktail dress by Pierre Balmain — made from black velvet ornamented with chiffon roses — romantic and elegant. Another attracting attention item is a Yohji Yamamoto black cage corset — a little bit futuristic, a little bit alarming, looking more like a sculpture than a piece of cloth. 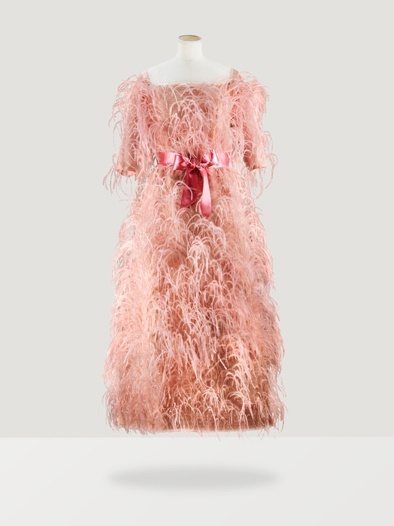 Also flattering is an extravagant evening dress entirely covered with pink feathers, worn by Francine Weisweiller — Jean Cocteau’s muse, acclaimed as one of the most stylish woman in Paris in 1960s. The sale is really an event in the History of Fashion because it is covering all the 20th century from Paul Poiret to Yamamoto, says Camille de Foresta, who is in charge of the collection at Sotheby’s, We will also have several iconic pieces from Schiaparelli, who is so rare at Auction. (...) Some pieces are also very important for their famous provenance. And last but not least, there is no designer from the 20th missing, it is a very complete sale. All items are the great testimony of history and a couturier unmistakable style. Due to Didier Ludot, they have a chance to get a second life — they will be purchased not only by private collectors or museums, but also by women mesmerized by the glow of vintage fashion.